The weather was rotten this evening. It had been raining all day and the high winds had damaged a few tents. We expected it to be quiet tonight and in fact, only 36 people came in, but it felt like 60. Jan made Spaghetti Bolognese with garlic bread and we had fruit pies and custard. The food went down very well and it was all consumed. Chris Boulton (Chief Executive of Greenham Trust), John Hampson, (organiser of the Best in Business Awards) and Andy Murrill (Editor of the Newbury Weekly News) all came in to give us the cheque that we won during the awards at the Racecourse last month. We are continuously grateful for the support from Greenham Trust and the Newbury Weekly News. It is important that the plight of the local rough sleepers, homeless and vulnerable community is recognised locally and they help us do that. 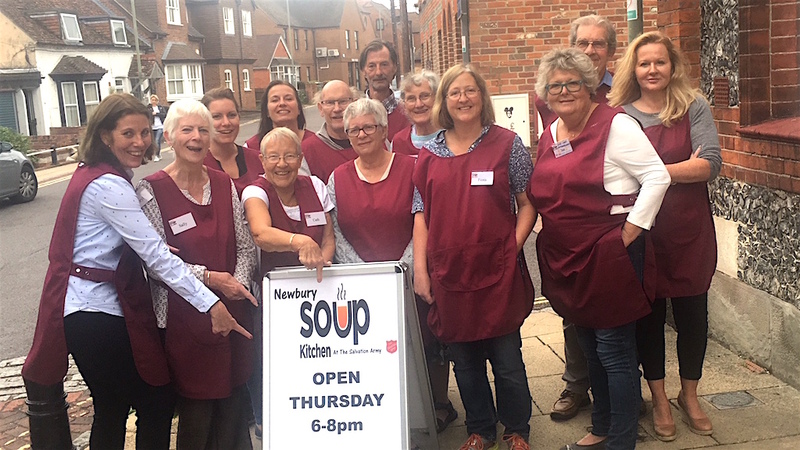 Newbury Soup Kitchen volunteers proudly accept cheque from Newbury Weekly News and Greenham Trust. Saddleback Farm Shop had a wonderful Festive Christmas market last weekend of which they kindly chose the Soup Kitchen as their Charity. There were many beautiful stalls selling items from crochet gifts to cheeses. The stallholders donated their pitch fees to us and we had charity buckets dotted around. Meryl talked about homelessness and rough sleeping. Many people were shocked that rough sleeping was so apparent in West Berkshire. We are pleased to say that they raised over £300 on the day and with tree auctions and other donations still coming we have been assured that will increase. The staff made us feel very welcome and we wish to thank them very much for their generosity and kindness. There was an undertone all evening. Quite a few people were on edge, drunk or very, very sad and emotional. It is a difficult time of the year for some people. As Christmas is looming, it makes loneliness and the plight of rough sleepers evermore realistic. Many people spend Christmas alone and without a roof over their head. For a plethora of reasons, they are unable to go home to their family or do not have any family that they keep in touch with. These emotions can escalate as the festive season approaches. We are working to provide as much festive spirit as we can and to put things in place to help alleviate some of the feelings of loneliness. We have our Christmas Party planned for Thursday 20th December. Other charities locally are organisations to bring some festive cheer to the people that need it too. Rocking Horse Sweets of Hungerford have surprised us and announced that they are donating some candy canes and sweet bags for the Christmas Party. Lakeland Newbury have already donated chocolate together with novelty Christmas table games and hot off the press, we will have an appearance from Santa, courtesy of Palmer Agencies costume company all the way from Belfast. The rough sleeper community is very close. They look out for each other and we have seen many acts of extreme kindness. Sometimes, however, emotions can run high. Holding down a relationship in stressful living conditions is very difficult. We often witness relationship arguments which can overflow into quickly fired aggression. The volunteers are experienced enough to be able to de-escalate a situation if it arises, to reassure and negotiate situations down to a calmer level if needed. Situations can escalate very quickly and the level of aggression can come in an instant. We have to be aware all the time and watch the different scenarios in the room to try to pre-empt an issue before it arises. The aura of the Soup Kitchen changes during the build up towards Christmas too. The local community become very generous and this is always most welcome. 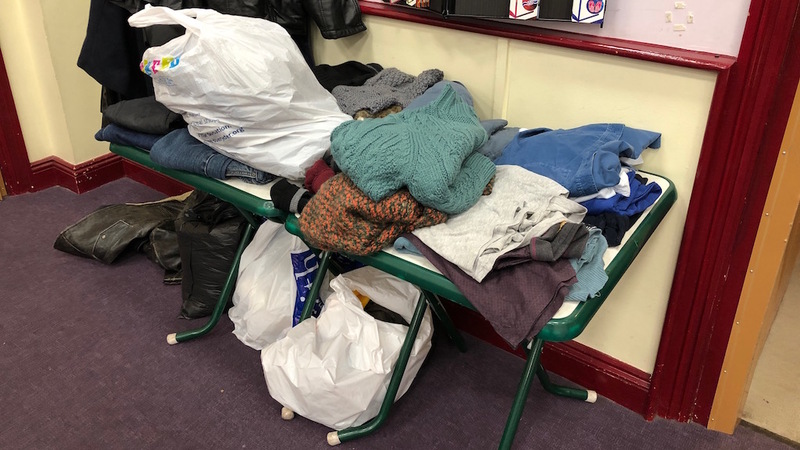 Over the last few weeks, the public has been amazingly generous and we have been overwhelmed by donations of clothes and items from our Wish Wist. Many benefactors want to come and donate gifts and donations in person and we are most welcome to meet you to say thanks in person. However, this is causing complications during the operational hours of the Soup Kitchen. You are welcome to visit between 16.30pm and 17.30pm to drop off items from our Wish List but please, do not arrive during our operational hours between 18.00pm and 20.00pm. We appreciate that people are making special efforts to visit us on Thursdays, but the influx of unannounced public visits is mandating that some people are regrettably turned away. Our Christmas Party is on Thursday 20th December and we politely ask that no public visits are made at all during this evening. We are overwhelmed by the generosity of the public and community this year. Due to this amazing support, we also need to announce that storage space is becoming a problem and we have more than adequate stocks of donated clothes and Wish List items. It’s only the beginning of December and we are bursting at the seams with donations. 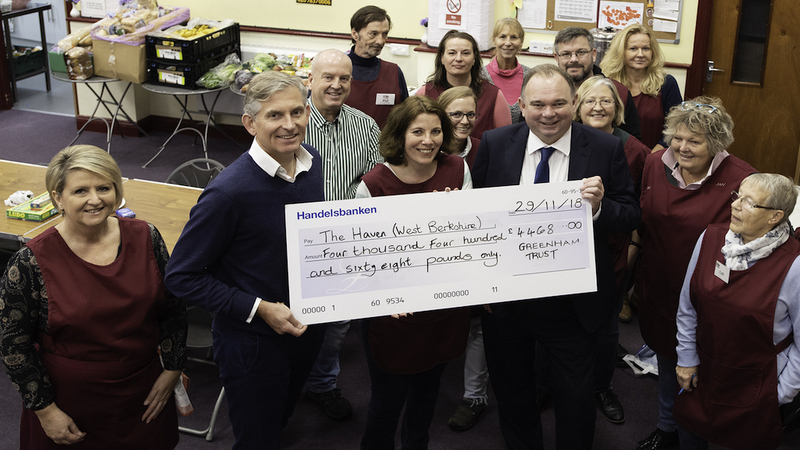 At last Thursday’s session, there were as many people from the public as there were clients welcomed into the Soup Kitchen, each member of the public with a donation. Everyone here at the Soup Kitchen wishes to thank each and every benefactor for their continued support, but we have to ask that we place a pause on some donations for the foreseeable future. Due to the massive contribution of tents and sleeping bags collected from the Reading Festival Cleanup, we have a surplus of these items. We are pressed for space at our storage facilities and have boxes full of nearly new items of clothing too, including footwear, blankets and sanitary ware. What a fantastic problem to have. However, we still have requirements for simple items like bicycle padlocks and head torches for our clients which are on our Christmas Wish List and is changing weekly. Our Amazon Wish List is also fluid and changing weekly. By example, a new item this week was the requirement of take-way-boxes. There are some rough sleepers who do not visit the Soup Kitchen, so we have started to take out food onto the streets from this week. Please bookmark our Christmas Wish List and our Amazon Wish List. Some of the clothing we have received laid out for the homeless and rough sleepers to choose. 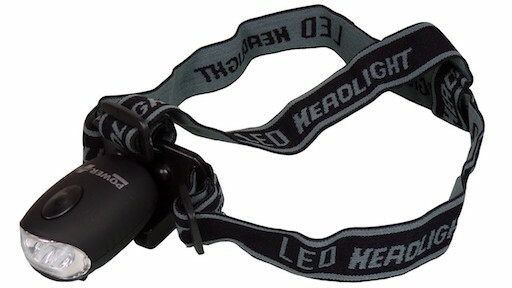 We are still in need of head torches. We find the wind-up work well as there is no need to source replacement batteries or re-charge. 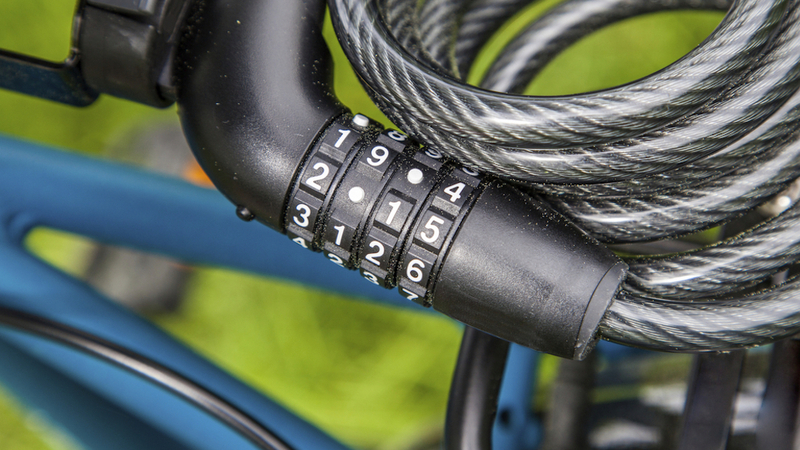 Strong bicycle locks are required as our rough sleepers are having their bikes stolen. We find combinations locks work well as keys are not lost. Self-harm is a worrying and upsetting episode that can happen to people who are extremely stressed, emotional and frankly at rock bottom. We see this at the Soup Kitchen regularly. People in crisis who feel they have nowhere to go and nowhere to turn. At the sessions, we try to sit and listen, encourage that person to eat something and drink some fluids and make them feel safe and welcome. Often they will talk about their situation to us. We are in the position now to be able to refer people to organisations locally. Meryl can refer to the MEAM and Blue Light organisations and if someone is at immediate risk, speak to CRISIS. We have the support of local police and paramedics too. However, due to the singular and evening opening time of the Soup Kitchen, all mental health support escalation routes are shut. Meryl has worked hard to network as much as possible to gain strong working relationships with the statutory organisations who can provide the support that our clients often need. For us, our option is often to call the police as other services are shut. This puts a lot of pressure on Thames Valley Police at a time services are under budgetary constraint, but at least they can organise a mental health assessment if necessary to keep someone safe. Our JustGiving Account was opened this week. A number of benefactors have been asking of we have a JustGiving account for monetary donations. We are happy to announce that this week we have opened our own JustGiving account under our HAVEN (West Berkshire) name. This is just the first step in a longer fundraising plan. Please feel free to donate via our JustGiving account. Two Saints are very accommodating and work hard to help everyone, but do have rules around situations. Pets are always a consideration, especially with a rough sleeper. Animals have to be vaccinated, checked over and de-flead and wormed. The Hope Project from the Dogs Trust and the lovely ladies at the RSPCA locally help us as much as possible to look after and treat the animals. Two Saints have more dogs at the moment that they usually accept. Many rough sleepers have dogs that they cannot leave or give up in order to gain accommodation. Animals are often the most important thing to someone who is rough sleeping. They may have a chaotic life, especially if a drug user. Having a dog to be responsible towards can be a good influence and encourages responsibility and consideration. The dogs are very well cared for and usually are fed better than their owner. It is common that a person sat begging is hungry, whilst having a bag full of treats and dog food is given by the generous public. At present we are working with the animal charities to get a cat neutered, micro chipped and vaccinated so his owner can go into the local hostel! Like this evening, some weeks the sessions can be stressful and upsetting for clients and volunteers alike. Incidents will always occur that will throw us, upset us and make us doubt our ability and question why we volunteer for the Soup Kitchen. We work hard to remember our clients are living in very stressful and difficult situations. Often these people have serious mental health issues, addictions and frustrations. Sometimes people are paranoid and only have themselves to protect and stand up for. Their lives are tough every day, every minute of the day. We must never take anything personally. We do a good job. An amazing job and the best we can. To work as a strong team, having each others backs all the time is paramount. The success of the Soup Kitchen and the people within that hall every week shows the impact it has and the fondness people have for it, be it our wonderful clients or our amazing volunteers.